I was wondering if there was any way to use hardcoded raw material costs for net profit inputs in LSW? 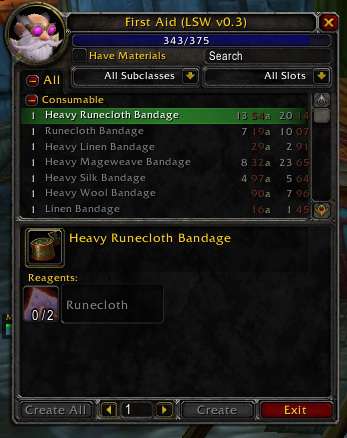 In my opinion, hardcoded "average" values preferably since i normally won't buy above a certain price for raw material 'x', or potentially long-term purchased prices fed from another addon like Auctioneer. it's something i've considered, but the biggest hurdle is coding up a ui to handle it. if you use auctioneer, you can use the Appraiser price module for your costs. then, in appraiser you can adjust the pricing scheme on a per-item basis. by default, it's market price, but you can change it to "fixed" and set the price you want.